A list of major changes can be found at Changelog 2016.2. 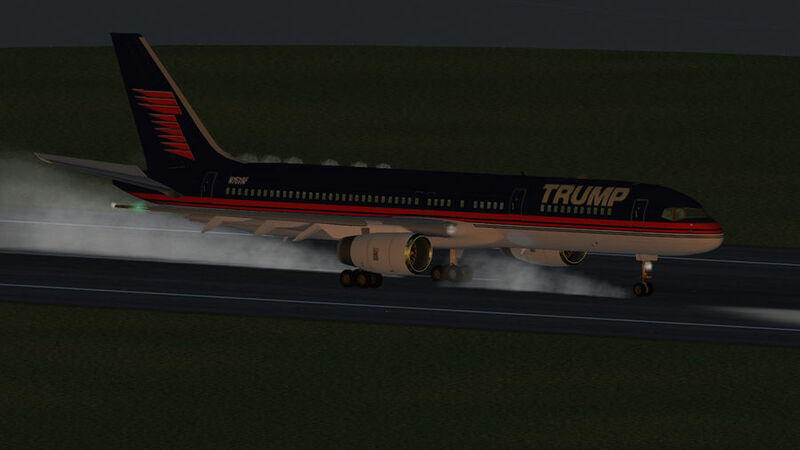 FlightGear v2016.2 is available for a variety of operating systems from http://www.flightgear.org/download/. Thanks to work by Torsten Dreyer, TerraSync now uses HTTP to fetch scenery. Some advantages to this method are is simpler code, requiring less space, and making it much easier to set up a TerraSync server. Erik Hofman has added support for XML expressions in the volume and pitch sections of audio configuration files. If an expression is found in <pitch> or <volume> it gets processed and the rest is ignored. If an expression was defined in a volume or pitch definition of a sound-section then all other volume or pitch sections containing a property are ignored. Sections with <internal> are always processed so timed sounds are still available. This way you can add volume and/or pitch sections with an expression before all other sections and keep backward and forward compatibility. But you could, for example, make the expression section more complex for newer versions of FlightGear. There is a new aircraft in FGAddon — the Icaro Laminar 13 MRX. It is an advanced weight-shift controlled hanglider build by ICARO in the early 2000s. The aim of this project is to provide a very realistic hang glider which shows all the specific properties of a real hang glider. 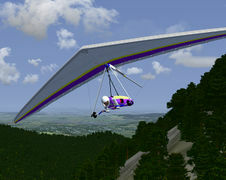 In particular the unique flight dynamic behavior (compared to common aircraft) is focused on. 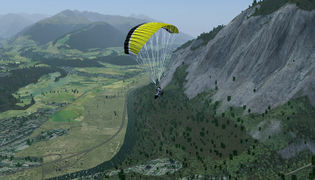 David Culp's paraglider has had major FDM and 3D model update. The FDM is now a true ram-air type. In addition, a small engine has been added and the parachute itself is now animated. Note As of June 2016, there is a bug prevents the paraglider from loading properly at FG 2016.2's default airport (Barcelona). Any other airport does not seem to cause a problem. Das FlightGear Wiki braucht noch Hilfe für sie in verschiedene Sprachen zu übersetzen. Wenn Sie bei der Herstellung der FlightGear Wiki mehrsprachiger interessiert sind, können Sie, indem Sie auf Help:Übersetzen beginnen. FlightGear's Screenshot of the Month May 2016 is Landing in Frankfurt's 25L by Ambro. If you want to participate in the screenshot contest of June 2016, you can submit your candidate to this forum topic. Be sure to see the first post for participation rules. For purposes of convenience and organization, after all the entries have been submitted, a new forum topic will be started containing all shots in an easy-to-view layout. The voting will then take place there. Once the voting has finished, the best screenshot will be presented in the Newsletter edition of June 2016. ↑ Erik Hofman (May 31st, 2016). [Flightgear-devel] New XML Sound feature. ↑ Gilberto Agostinho (May 17th, 2016). [Flightgear-devel] c172p ready for the Barcelona release. This page was last modified on 9 June 2016, at 04:06.